The decision to launch this year's International Dance Festival Birmingham with this one hour piece by Brazilian choreographer Guilherme Botelho's Alias is a brave one as it certainly doesn't make for easy viewing. 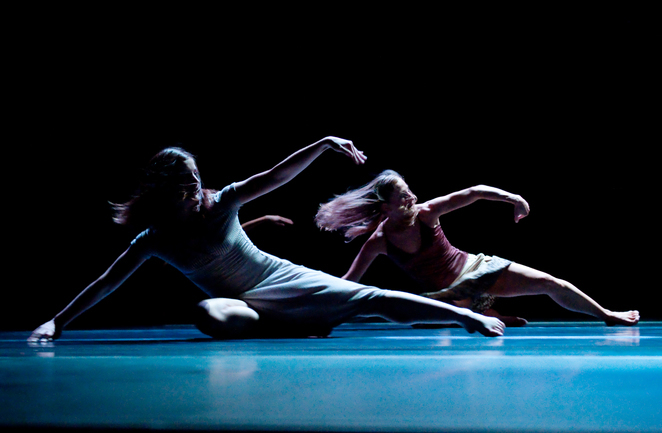 The piece, in which 16 dancers move in syncrhonised precision across the stage from left to right, is challenging in many ways. It begins with a constant flow of dancers spider crawling across the stage – their movements are angular and feel awkward from the comfort of our seats in the Birmingham Hippodrome auditorium. Gradully over the next hour the figures change, they roll, they turn, they fall and they rise until, by the end of the show they are standing and running. It is a kind of evolution of movement which reflects those drawings we all studied in school where humans gradually develop from animal to person. The strength, control and endurance of the dancers is amazing. Much of the movement is painfully slow but at other times it breaks out into a fast pace. And they are no sooner off stage right than they are back on stage left. There seems to be no moment for them to pause and catch breath. This is also the case for the audience. The motion is relentless and yet its sheer repetition has a power to hypnotise us so that we can simply sit back and watch. The electronic music created by Murcof and Pablo Beltran Ruiz is perfectly paced to the dance and has a similar blend of languor and urgency. Jean-Philippe Roy's strong lighting is an integral part of the action, highlighting movement and forcing the eye to certain places at certain times. In fact at moments its harsh light and the rapid movements of the dancers cause the actual bodies to blur into a whirl of white light so that you are losing track of what is body, what is movement and what is the spectre left behind. The final scenes in which the dancers run across the stage carrying string ahead of them so that the space becomes a network of fine lines is particularly dramatic and works really well on a stage the size of the Hippodrome. Sideways Rain isn't going to be for everybody – not least because as the final affirmation of humanity, the dancers leave their clothes behind and race naked across the stage.